UD Quon GW25470 hi-tensile FUPS aluminium bullbar. 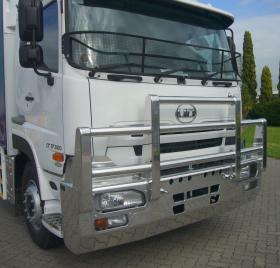 heavy duty contoured channel to suit driving, plus fog and indicator lights. Main cross tubes are one piece 76mm tube through drilled uprights and recessed into the outer uprights. Tow pin and heavy duty steel backing plate. Driving light mounts can be fitted to customer requirements. 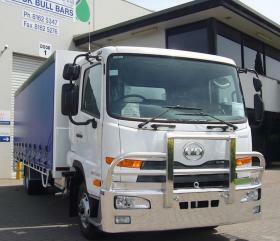 UD Quon GW25420 hi-tensile FUPS aluminium bullbar. 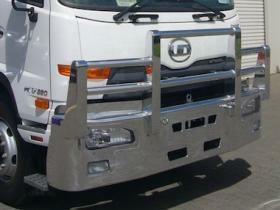 heavy duty contoured channel to suit factory fitted driving, fog and indicator lights. 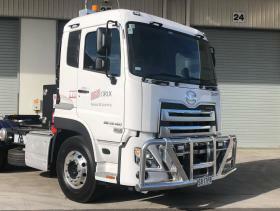 Custom low level contour design to allow for daily checks to be completed without lowering the bullbar. Hi-tensile 76mm tube are recessed into the uprights and reinforced on the outer channel mount. Tow pin and heavy duty steel backing plate. UD PK17 hi-tensile FUPS aluminium bullbar. 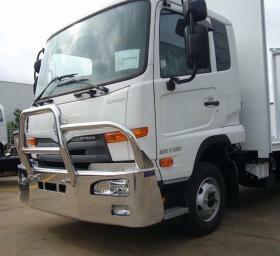 Heavy duty contoured channel to suit driving,plus fog lights. Main cross tube is one piece 76mm tube through drilled uprights and recessed into the outer uprights with bent upper pipe. Tow pin and heavy duty steel backing plate.Driving light mounts can be fitted to customer requirements. UD PK 17.280 Condor hi-tensile FUPS aluminium bullbar. 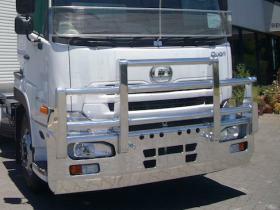 Four post design with heavy duty contoured channel to suit driving, plus fog lights. Main cross lower tube is one piece tube through drilled uprights and recessed into the outer uprights. All 76mm heavy walled tube. Tow pin and heavy duty steel backing plate. Driving light mounts can be fitted to customer requirements. Optional poly-carbonate light covers. UD MK11.250 Condor hi-tensile aluminium bullbar. 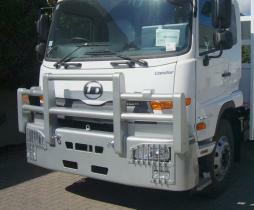 heavy duty contoured channel to suit driving,plus foglights. Main cross tubes is one piece 63mm tube through drilled uprights and recessed into the outer uprights. Tow pin and heavy duty steel backing plate.Driving light mounts can be fitted to customer requirements. Optional poly-carbonate headlight covers. UD MK11.250 Condor hi-tensile aluminium bullbar. 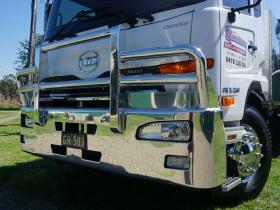 heavy duty contoured channel to suit driving,plus foglights. Main cross tubes is one piece 63mm tube through drilled uprights and recessed into the outer uprights. Tow pin and heavy duty steel backing plate. Driving light mounts can be fitted to customer requirements. Optional poly-carbonate headlight covers. UD Quon GW25470 hi-tensile FUPS aluminium bullbar. 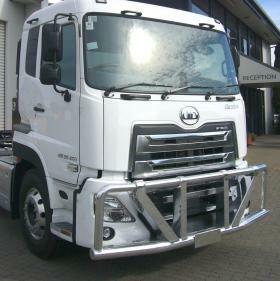 heavy duty contoured channel to suit factory fitted driving, fog and indicator lights. Main cross tubes are one piece 76mm tube through drilled uprights and recessed into the outer uprights. Tow pin and heavy duty steel backing plate. Driving light mounts can be fitted to customer requirements. UD PW Condor hi-tensile FUPS powder coated aluminium bullbar. 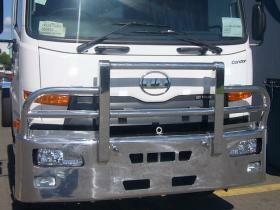 Heavy duty contoured channel with removable guards for headlight and fog lights . Main cross tubes are one piece 76mm tube through drilled uprights and recessed into the outer uprights. Tow pin and heavy duty steel backing plate. Driving light mounts can be fitted to customer requirements. 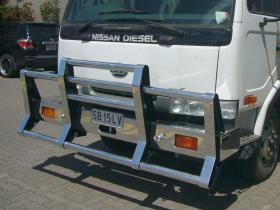 Nissan MKB Non Fups Bullbar features one piece upper and lower full width high tensile 63mm tube with 6mm wall. The centre additional tubes are of the same material. Heavy duty 6mm high tensile alluminium I-Beam uprights, steel backing plate and tow pin. UD Condor hi-tensile FUPS aluminium bullbar. 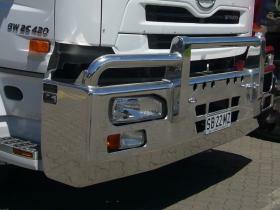 heavy duty contoured channel to suit factory fitted driving, fog and indicator lights. Contoured cross tubes are 76mm tube recessed into the centre uprights plus reinforced outer uptight mounts. Tow pin and heavy duty steel backing plate. Driving light mounts can be fitted to customer requirements. 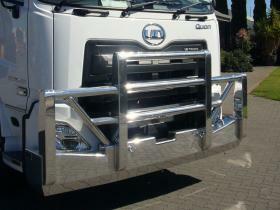 UD Quon hi-tensile FUPS compliant polished aluminium heavy duty Wild Bar Style bullbar. Contoured cross tubes are 76mm tube recessed into the heavy duty 100mm wide outer box uprights and 76mm wide inner box uprights mounted on a reinforced 100mm diameter heavy wall high tensile aluminium bar. Mounted on an high tensile heavy duty aluminium backing plate. The low profile allows for access under the front grill panel without dropping the bullbar. Total weight= 110kg. UD Quon hi-tensile FUPS compliant polished aluminium heavy duty Wild Bar Style bullbar with additional main cross centre rail for added protectoon. Contoured cross tubes are 76mm tube recessed into the heavy duty 100mm wide outer box uprights and 76mm wide inner box uprights mounted on a reinforced 100mm diameter heavy wall high tensile aluminium bar. Mounted on an high tensile heavy duty aluminium backing plate. The low profile allows for access under the front grill panel without dropping the bullbar. Total weight= 110kg. 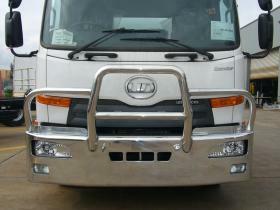 UD Quon GW hi-tensile FUPS aluminium bullbar. heavy duty contoured channel to suit factory EBS system sensors. Main cross tubes are one piece 76mm tube through drilled uprights and recessed into the outer uprights. Tow pin and heavy duty steel backing plate. Driving light mounts can be fitted to customer requirements.